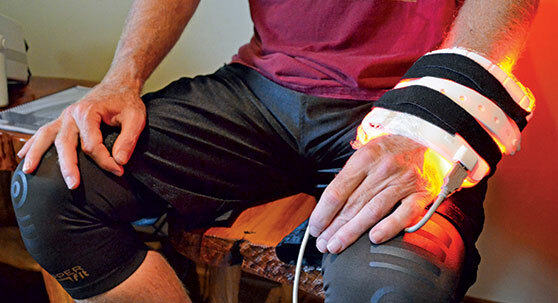 Light Therapy: An Alternative To Pain Management - LightMD, Inc.
Cordillera Ranch Living Magazine has brought attention to LightMD’s new presence as a premier vendor for the Titleist Performance Institute by featuring the following pain management article by LightMD’s own CEO and President. As we age, particularly if we engage in exercise or competitive sports, our bodies invariably experience physiological stresses associated with being subjected to injury, disease, immune distress and even normal hormonal changes. The result of this relentless cascade of misfortunes is reduced circulation and a systemic decrease in tissue and organ oxygenation, in turn causing inflammation, muscle fatigue and tightness, decreased range of motion, localized tissue pain, a greater propensity for injuries (primarily from hyper extensions or muscle cramps), and in many cases the onerous onset of chronic pain invariably leading to debilitating arthritis of muscles and joints. While many hardware platforms and commercial gadgets promise efficacious phototherapy treatments to suffering patients, the truth is the vast majority of phototherapy devices lack the power or the required degree of control and knowhow to insure light penetrates the body’s epithelial layer and is absorbed, i.e. metabolized, by the underlying tissue targeted. Based on over a decade of case studies and engineering developments, the ABP1003 Phototherapy System available in the USA exclusively from LightMD represents the state-of-the-art in medical-grade phototherapy. Each system comprises a touch-screen based “LightMachine” central controller and two sets of 3D-bendable flexible hypoallergenic polymeric LightPads, with each of the six LightPads containing hundreds of super-luminous (i.e. high-brightness) red and infrared LEDs. In use, the snug fit offered by its bendable LightPads to the human torso and appendages insures superior energy coupling into affected tissue with minimal unwanted reflections or scattering. Each LightPad is driven in a programmed sequence or “treatment” (typically lasting 20 minutes) comprising alternating intervals of red and infrared light (to control penetration depth) pulsed at prescribed rates to maximize energy coupling to specific tissue types. Treatments, in turn, are organized into sequences called “protocols” to insure pain, inflammation, and infection are combatted systematically to speed recovery. LEDs are driven at their maximum possible brightness to insure treatment efficacy yet to avoid burn risk and insure photobiological safety (a safety level lasers cannot guarantee). Moreover, based on a decade of exhaustive case studies, the importance of LED pulse frequency rates and the system’s versatile control of these pulse rates cannot be overstated. For example, high frequency pulsed operation reduces pain by controlling signal transduction throughout the nervous system while lower frequencies are used to stimulate the release of nitrous oxide (NO) thereby improving vasodilation and tissue oxygenation. As a class II device, the light therapy offered by LightMD is based on FDA audited and approved technology now authorized for use in the USA, in Taiwan, in Dubai, and across the United Arab Emirates (UAE) with more countries coming soon. In addition to its global medical, safety and GMP (good manufacturing practices) certifications, the device is also protected by numerous claims granted by the United States Patent & Trademark Office (US PTO) to its FDA approved manufacturing business partner Applied BioPhotonics Ltd.